Adam was born on 27 January 2010 in Poznan, and until March 2012, he was healthy and cheerful child.After 2 rotavirus infections he developed a chronic diarrhea, due to the course of the disease, doctors thought that the intestine was damaged by a virus, no one suspected another reason. But the weeks passed, and the treatment did not yield results. Thus began a journey from one doctor to another. One of them said that Adam’s mom is oversensitive and should not have brought Adam to the hospital. Another without doing any research has ruled that it is definitely allergy and suggested gluten-free diet. In the meantime, a blood test done at a private clinic ruled out allergies, however, the doctor said that it is a type of allergy which is not manifested by an increase in the level of antibodies in the blood and that we should wait until the child is three years, to perform skin tests. Fortunately, we did not believe the doctor, and kept looking for answers on our own. Adam stopped growing, his weight halted, even hair and nails practically ceased to grow. In the meantime, there were recurrent “bronchitis” lack of response to antibiotics or anti-allergic drugs, excessive sweating, rapid pulse, transient temperature spikes, rash on the face, arms and thighs. Introduced diet did not help with diarrhea. A privately conducted abdominal ultrasound examination also did not reveal any abnormalities. Genetic tests for celiac disease and cystic fibrosis were negative. We wanted to perform chest X-ray at all cost, however, none of the doctors agreed to issue the referral explaining the child’s unnecessary exposure to radiation, and unfortunately this type of research can not be done without a referral. Nobody wanted to also issue a referral to the hospital for further study. Adam felt worse and worse, in a few months, he visited several doctors (pediatricians and gastrologist), all insisted on allergies. In August, Adam went on vacation. Fortunately, Adam and his family went with a friend of her mother and mother in law – a nurse with 20 years of experience, who noticed that something causes tightness in the chest and concluded that Adam requires x-ray. She suspected heart enlargement. This time, Adam’s mother did not give in doctors and x-ray examination was performed, which revealed a big shadow in the left lung. At first Adam was sent to Branch Pulmonology, but after ultrasound he was transferred to Branch Pediatric Hematology and Oncology Clinical Hospital No. 5 in Poznan, where he began his fight against neuroblastoma. A series of studies, computed tomography of the chest revealed a large (8.7 × 7.3 × 10.5 cm) tumor behind his left lung, the leading doctor said that with such a large tumor on 100% will also metastases. MIBG study revealed no metastases! Next, urine collection, magnetic resonance imaging of the head, biopsy and finally the diagnosis – neuroblastoma third degree (ganglioneuroblastoma / neuroblastoma maturing type without the amplification of N-myc). It was found that the tumor is inoperable and Adam has to begin chemotherapy as soon as possible to reduce it. Even before the results of all studies Adam received the first cycle of chemotherapy (COJEC block A), and took it very hard. Adam spent consecutive weeks immobilized in a hospital bed, connected to the drain, because lymphorrhoea persisted. After 3 weeks of the second cycle of chemotherapy was given (CAPD), but the symptoms were still not resolved, so it was decided to perform a CT scan, the result – the tumor did not decrease by a millimeter, parents were desperate. Then with the help came a surgeon from the Cracow University Hospital in Prokocim – Prof. Andrew Prokurat, who decided to operate Adam. He said that the tumor has not decreased after chemotherapy because it is too mature, less malignant, and these tumors do not respond to cytostatic drugs. Poznan surgeons did not want Adam to redirect the operation to Krakow, insisted that they are able to remove the tumor (which was previously called unresectable), but Adam’s parents because of the complication of the biopsy did not want to give her son back into their hands and arranged for transfer to Krakow. There doctors finally managed to control lymphorrhoea and remove the tumor. Professor Prokurat did a fantastic job! He left only a remnant of the tumor in the spinal canal, because the operation inside the duct would be too dangerous, and there was no need, because some residual tumor does not cause spinal cord compression or other neurological disorders. After surgery, Adam returned to Poznan to continue chemotherapy. All symptoms resolved, but that MIBG showed residual tumor mass was still active, so the treatment could not be stopped. In the meantime, the histopathological examination of the tumor came back with a nasty surprise – N-myc (+). Suddenly, despite the fact that there were only a cubic millimeter tumor it’s been decided to continue with the European program – COJEC protocol, mega chemo, autologous bone marrow transplantation. Adam’s parents did not agree with the program and decided to move the child to Children’s Health Center in Warsaw, it was the best decision. In Warsaw, doctors used a more accurate method to test tumor, the result of amplification of N-myc has turned negative, previous positive result was a simple random error. 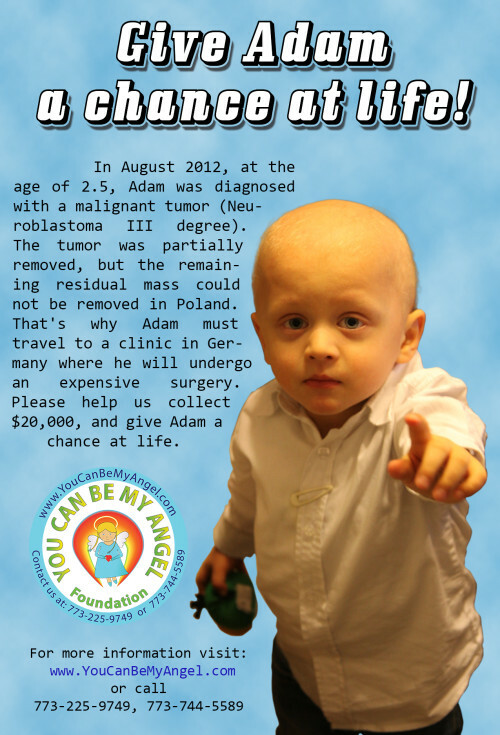 Adam continued his treatment at the Center for Child Health. Parents felt that he was in good hands. Memorial Health Institute in Poland is the most experienced in the treatment of childhood cancers, especially those rarest and most unusual, non-standard treatment protocol, completely different from the so-called European program. In CZD Neuroblastoma is not a judgment, we know there are already many children with this disease, most diagnosed with stage IV, but the treatment is withoutcomplications and has great results – a high cure without recurrence. After the operation, Adam received 7 more cycles of chemotherapy, then went on a half-year of maintenance therapy cis retinoic acid. Maintenance therapy was completed in October 2013. The residual matter unfortunately did not regress, on the contrary it strengthened after the administration of contrast in MRI, collects MIBG scintigraphy marker and secretes catecholamines. It’s still active, living tissue tumor that must be kept under constant observation. Since the end of the treatment, Adam undergoes regular checkups (magnetic resonance imaging, MIBG scintigraphy, and blood and urine tests). Adam’s tumor is very unusual, this type of tumor accounts for only 2-4% of all cases of neuroblastoma, which in itself is a rare disease. Because of this parents decided to consult Adam’s case abroad. MSKCC in New York City suggested to perform checkups (MIBG, magnetic resonance imaging) every three months in the first two years after completion of treatment. Due to the fact that the Polish guidelines recommend performing these tests every six months, parents are required to perform them do privately. Parents consulted doctors at the University of Tubingen. The MR results compared to 2013, after completion of chemotherapy, revealed that the tumor in the spinal canal has grown significantly and has increased the compression of the dural sac. Although the spinal cord is not yet heavily compressed, but it will happen if there is a further grow. Doctors believe that slowly has come the time to remove the tumor. Doctors do not want to wait until compression symptoms appear and want to proceed with the surgery. The cost of the surgery has been estimated at $20,000. Help us collect $20,000, and give Adam a chance of life. We are confident that Adam will stay healthy, there is no other option!